The Aggees came to Skagway from Telluride Colorado. Alonzo Aggee and his sons Roy and Harry arrived via the Chilkoot Pass on October 9, 1899 yet Alonzo, his wife Martha or Madie Crouch and their son Alonzo Jr.(Sam), daughters Helen and Ollie all show up on the Skagway census in 1900. They may have been in the process of moving to Dawson when the census took place. Oddly, despite the fact that they were one of the few African-American families in the Yukon, the Skagway census lists them as being white. 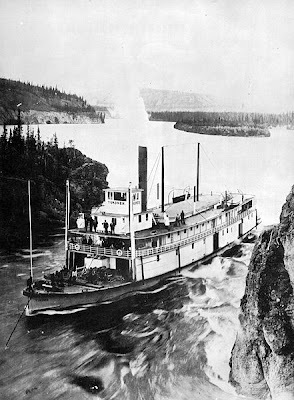 Alonzo worked for a time as a deckhand on the steamers going up and down the Yukon River. 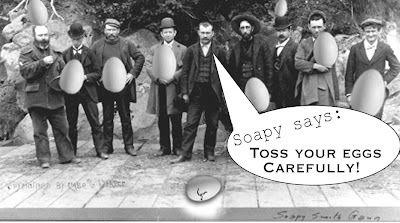 Then he settled down in Dawson City as a barber, and the rest of the family, including his wife Martha, sons Sam and Harry, and daughter Helen arrived soon after. 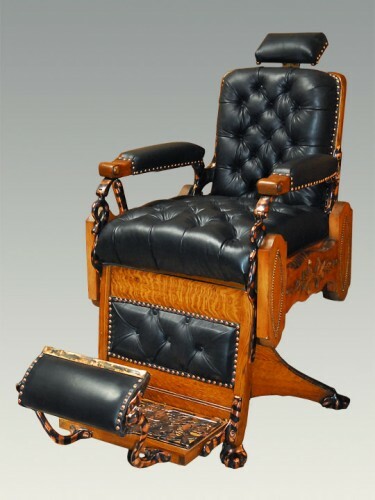 Harry and Roy worked as barbers with their father, but in 1901 Roy, the oldest son, died of peritonitis. The family carried on. 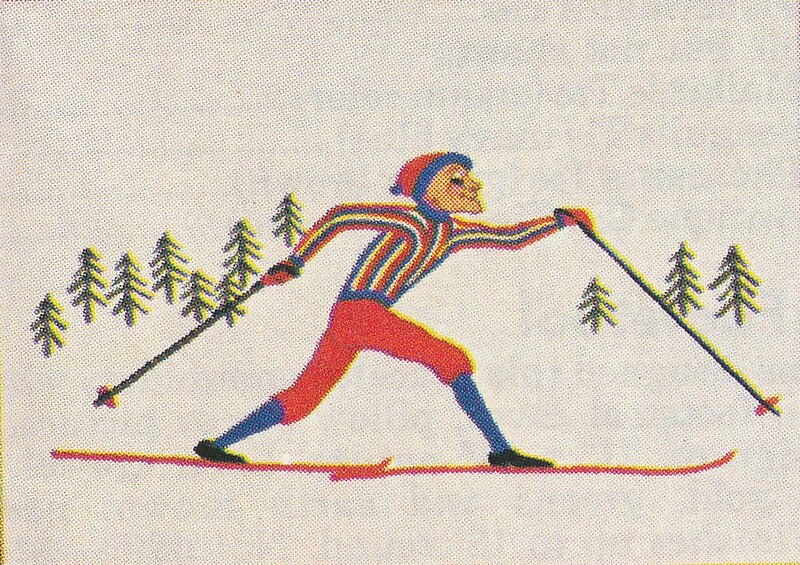 Sam gained fame as a member of Dawson City’s 1910 championship hockey team. He died in 1925 in Tacoma. Harry died in 1917 in Seattle and Martha in 1930. Alonzo L. Aggee outlived them all and died at the age of 81 in Skagit, Washington on December 21, 1940. -On the Trail of the Yukon’s Black Pioneers by Kilian; Washington death records; Skagway 1900 census. The brothers Krause were born in 1848 and 1851 in Konopath, Westpreussen, Preussen or what we would call Poland today. They were noted Anthropologists who explored the Chilkat and the Chilkoot Passes 1881. They spent the winter of 1881-82 at Haines, studying the Chilkat for the Geographical Society of Bremen and then wrote “To the Chukchi Peninsula and to the Tlingit Indians: A Scientific Expedition Carried Out by Aurel and Arthur Krause in 1881/1882”. 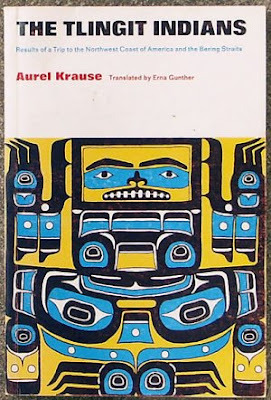 Aurel also wrote “The Tlingit Indians: results of a trip to the Northwest Coast of America and the Bering Straits” published in 1885, translated by Gunther in 1956. Unfortunately this did not have much effect on general knowledge since it was in German. In this 1885 account he describes Lake Arkell (or Kusawa) as an early trade route between coast and interior used by the Chilkats. By 1887 George Dawson said that the use of this route was declining by Tlingit traders because the journey from the coast to the head of the Takhini was so difficult. 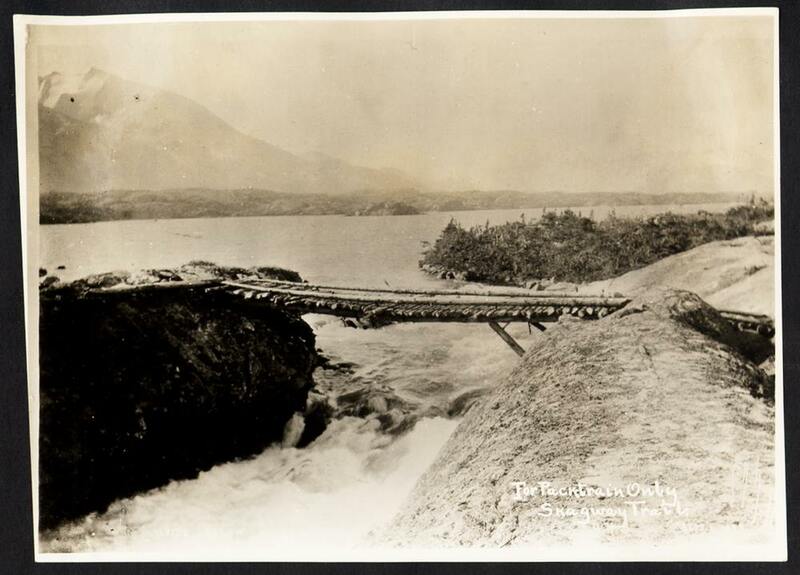 They began using the Chilkat Trail even though it was longer, yet less dangerous. I looked these up in the Alaska Atlas and was amazed at these routes which were not only longer but crossed several glaciers. No wonder they were more dangerous, there were stories of men falling into crevasses on those routes. It is easy to see on a map why the Chilkoot trail from Dyea became so popular. The Krause research was not only the earliest but some of the most comprehensive accounts of Northwest coast cultures before they were significantly changed by European contact. Aurel died in 1908 and Arthur died in 1922 both in Berlin. Walter Russell Curtin was born in 1878 in California and spent a terrible winter onboard the Yukoner where he froze. He wrote about that experience in 1938, more than thirty years after the gold rush. “I had thirty five cents in my pocket when I set foot in Alaska, but I gave that to a mission church at Dutch Harbour. I did not have so much left when I left the country more than two years later……. He died in Los Angeles on March 10, 1951. The Yukoner is seen above going through the infamous 5-finger rapids on the Yukon River. Here is a photo of that log bridge that Duke Prigmore wrote about in the blog from several days ago. Fritz, or Anton Frederick Gansneder was probably born in Oberellenbach, Bavaria. His father Jacob immigrated from Germany with his 12 kids in the early 1880’s. The importance of this is that the family brought their knowledge of growing grain and producing cheese, sausage and beer to the Milwaukee, Wisconsin area. Following the surge of German immigration America benefited from the traditional methods of brewing good ales. 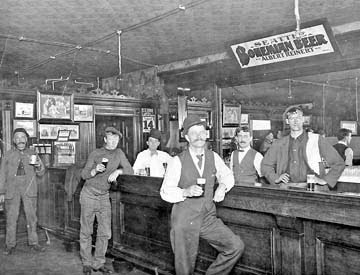 Certainly Skagway benefited from Fred’s contribution: the Beer by the Quart Saloon in 1898. Fred and Frank moved to Portland around 1896 and established businesses there. Fred came to Skagway briefly to run his saloon and then probably went back to Washington. Here’s a tip of the hat and a clank of a mug to Fritz! Gold Rush Grub: From Turpentine STew to Hoochinoo by Ann Chandonnet page 207; the Mascot Saloon by Spude p. 70 (misspelled as Gausnider). Happy Birthday to Clifford J. Rogers born on this day, December 22, 1887 in Winnipeg, Manitoba, Canada. He came to Skagway in 1900 and started working for White Pass in 1905, and eventually became President of White Pass. He and his brothers stayed in Skagway and all worked for the railroad. He was a naval architect and designed the first container ship. In November 26, 1955 the new White Pass container ship was named for him. The Clifford J. Rogers set sail for Skagway then with her first load of “containerized freight.” The new ship and containers, coupled with the upgraded and diesel engines on the railroad and trucks on the roads made the Yukon the home of the first integrated container system in the world. In 1965 the Rogers was sold and replaced with the 6,000 ton Motorvessel Frank H. Brown, one of the world’s most modern freighters. Clifford’s wife in 1909 was Elizabeth Gertrude Steutiford. In 1949, Clifford James Rogers Jr. married Patricia Colwell in Ellensburg Washington. Clifford Sr. died in 1978 at the age of 91 in Snohomish, Washington. 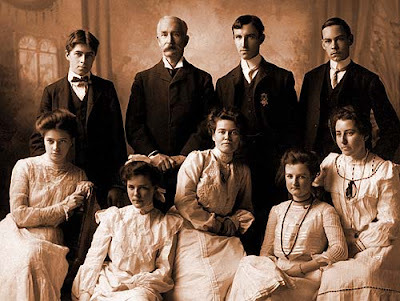 Seen above in the first Victoria College class in 1903 (age 16 far left). I’ve had this picture in my desk for years and thought I’d share it with you. There was an obscure reference in the Skagway Death records to a child “Preigmore” who died in April 1898. After much research and reading of old newspaper articles and censuses I was able to piece together the story of the Prigmore family. First I will quote the San Francisco Call of August 23, 1897. It refers to Duke Prigmore who made more than one trip from Washington to Skagway on the family’s quest for gold. SEATTLE, WASH Aug 22. Possibly the best description of the White Pass Trail from Skaguay is given in a letter from Duke Prigmore received in this city yesterday. It was brought down by the steamer Starr. After leaving camp on Saturday, Mr. Prigmore says, ‘The first three miles is a fairly good wagon road, which leads to the Skaguay river, a rather shallow but very swift stream. There the miners have erected an improvised bridge, over which only one horse can be taken at a time. Beyond the bridge for three miles horses and wagons can be used. Devil’s Hill is then reached. The trail is not over two feet wide here, while the climb is at an angle of 45 degrees. At the summit of the hill horses are compelled to make a jump of nearly two feet high only to alight on a slippery rock. Further on the trail is a steep incline, on which logs have been laid forming a kind of ladder. After crossing the first hill a half mile of fairly good traveling is encountered when the big hill is reached. The path over this hill can scarcely be called a trail as Mr. Prigmore says it is quite narrow and at places is almost impassable for horses. The formation is of a soft and slippery slate rock. The trail winds crookedly around the hill or rather mountain while below it sheers off 500 feet to the river. At this locality many horses and packs have been lost. It is almost impossible for horses to pack any considerable amount of supplies around this bluff. After traveling several miles of this kind of road the big marsh is reached. Here the packers become frightened as a horse will either flounder and roll in the mud until he gives up from sheer exhaustion, or else loses the pack and breaks a leg. This bog is one and a half miles long, and many of the miners are here camped waiting for the winter freeze so they can get over it. Well, Duke came south and got more horses to pack over the pass and in the winter of 1898 his father, Isaiah Daniel Prigmore, and Duke’s younger brother, Leroy, came along. It must have been on this trip that young Leroy succumbed to pneumonia and died in Skagway on April 2, 1898. 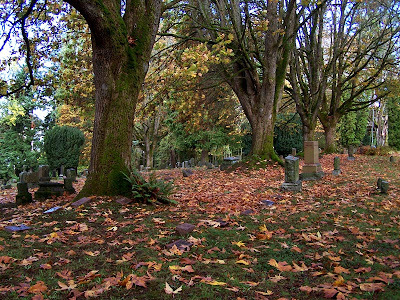 Isaiah took his body back to Washington and buried him in Bayview Cemetery in Bellingham. Isaiah and his wife Francis were also buried there in 1926 and 1935. Although I could not find an age for Leroy, or “Roy” as his headstone says, he must have only been about 9. Duke was 22 when he started this adventure, but he too died (of typhoid) in 1903 back in Ellensburg Washington at the age of 28. In all Isaiah and Francis had 8 children, the rest of whom remained in Washington and had families. 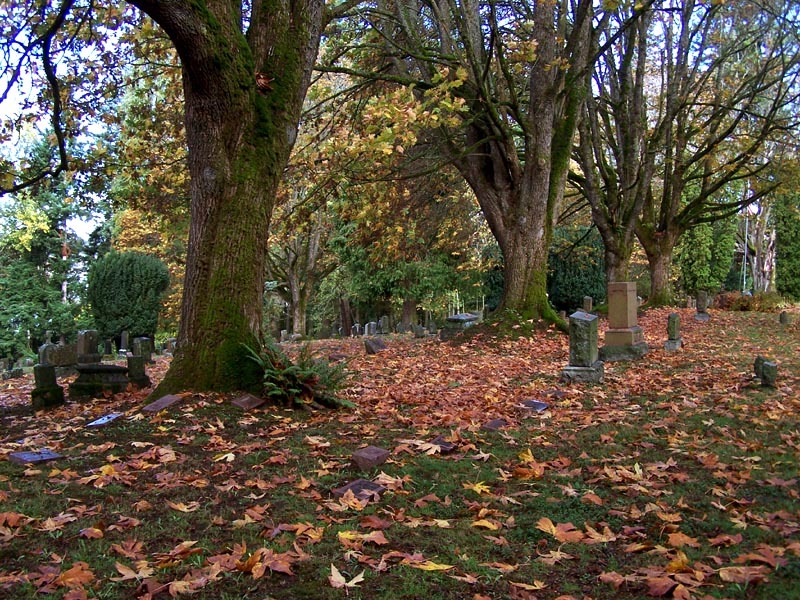 Seen above is the lovely Bayview Cemetery in Bellingham, Washington. 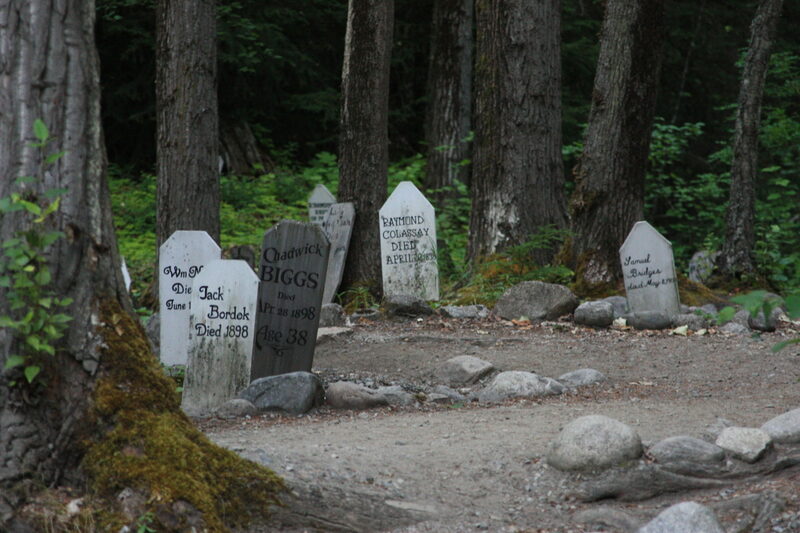 Bayview Cemetery online; various news accounts, family rootsweb info; Skagway Death record.